Kingfishers are small birds of the order Coraciiformes. There are about 90 species, mostly in the Old World and Australasia, Most species are tropical in distribution. Their feathers are often bright colours, such as blue or orange. They have large heads, long, sharp bills, short legs, and stubby tails. Most species have bright plumage with little differences between the sexes. Most are found only in forests. They eat a wide range of prey, including fish. They usually catch prey by swooping down from a perch. Many live near rivers and eat fish, but most species live away from water and eat small invertebrates. Like other birds of their order they nest in holes, usually tunnels dug into the natural or artificial banks in the ground. 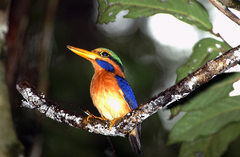 A quarter of all kingfishers nest in disused termite nests. Kingfishers are found all over the world. They often make their nests near rivers where the water flows slowly. They make their nests in tall river banks. They dig a hole in the side of the river bank. Most kingfishers lay 3–6 eggs each time. 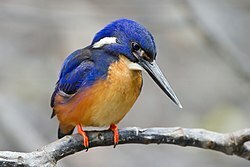 Many kingfishers eat fish. They sit on branches hanging over the river's edge and wait for a fish to appear. They then dive into the water to catch the fish. Some kingfishers eat lizards or other reptiles. Kookaburras do this. Most species are in the Australasian region, but the family did not originate there. They evolved in the Northern Hemisphere and invaded the Australasian region a number of times. Fossil kingfishers have been described from Lower Eocene rocks in Wyoming 50 million years ago (mya) and in Germany, around 30-40 million years ago. More recent fossil kingfishers have been described in the Miocene/Pliocene rocks of Australia (5-25 mya). ↑ Moyle, Robert G. 2006. Molecular phylogeny of kingfishers (Alcedinidae) with insights into early biogeographic history. Auk 123(2): 487–499. ↑ Moyle, Robert G (2006). "A molecular phylogeny of Kingfishers (Alcedinidae) with insights into early biogeographic history". Auk 123 (2): 487–499. doi:10.1642/0004-8038(2006)123[487:AMPOKA]2.0.CO;2. ↑ Woodall, Peter (2001). "Family Alcedinidae (Kingfishers)". In del Hoyo, Josep; Elliott, Andrew; Sargatal, Jordi (eds.). Handbook of the Birds of the World. Volume 6, Mousebirds to Hornbills. Barcelona: Lynx Edicions. pp. 103–187. ISBN 978-84-87334-30-6. This page was last changed on 23 December 2018, at 06:51.